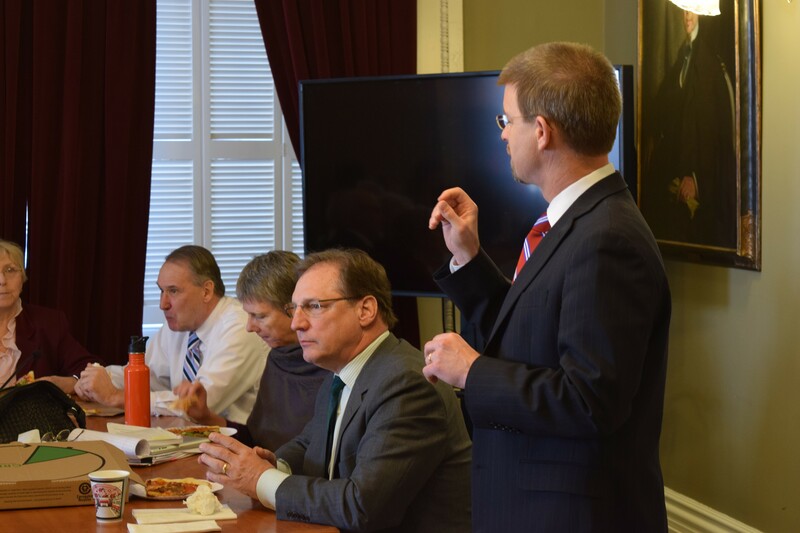 House Speaker Shap Smith speaks Wednesday to the Working Vermonters' Caucus. A day before House members were due to debate the state budget and tax packages, a revolt was brewing Wednesday among liberals lunching on pizza in a Statehouse meeting room. If they stick together, they can join most of the House Republicans and independents to defeat the tax bill, which would give them leverage over the future of the tax and budget bills, members argued. “This is our first chance to make a statement,” said Rep. Chris Pearson (P- Burlington), a member of the legislature's Working Vermonters' Caucus. In front of this group — about 25 Progressives and liberal Democrats upset that the budget cuts $53 million from state programs and includes $10.8 million in personnel savings — Smith emphasized that the budget is actually growing. The general fund budget is up 4.8 percent, he noted. That’s a number he would undoubtedly downplay if he’d been talking to Republicans. Instead, he was trying to sell this crowd on the fact that despite all the talk of cuts, the budget merely curbs the level of increase. When Smith was done talking, the group politely applauded. Smith left the room and members launched into a strategy to torpedo the $35 million tax bill. If they defeat the tax bill, they’ll have more sway in changing the budget bill that relies on the tax bill money, Pearson said. Members of the caucus will offer amendments Thursday with alternative tax options, Pearson said. If none of those passes, he said, he hopes members will stick together and combine forces with Republicans to defeat the tax bill. The group will likely be looking to pass one of these options: a $2-per-room hotel occupancy tax, which would raise about $10 million; or increasing the income tax on the highest-earning two tiers of Vermonters, which would raise about $12 million. The group wants to use the money to replace $5.8 million in payroll cuts included in the budget, as well as to restore funding to low-income heating assistance, Reach Up and Working Lands programs. Donovan voted for the tax bill as a member of the House Ways and Means Committee, but she said she will vote against the bill on the House floor if the amendments fail. She asked caucus members for a show of hands of who was in. Twelve votes would be enough alongside Republicans and independents who are likely to vote against the tax bill, Pearson said. Some members shifted uncomfortably in their chairs. Some walked out of the meeting. In the end, 13 hands went up. House Minority Leader Don Turner (R-Milton) said later Wednesday that most of his 53 members will be voting against the tax bill Thursday. Their opposition is 180 degrees from that of the Working Vermonters' Caucus. "Our caucus is opposed to raising new taxes," Turner said.